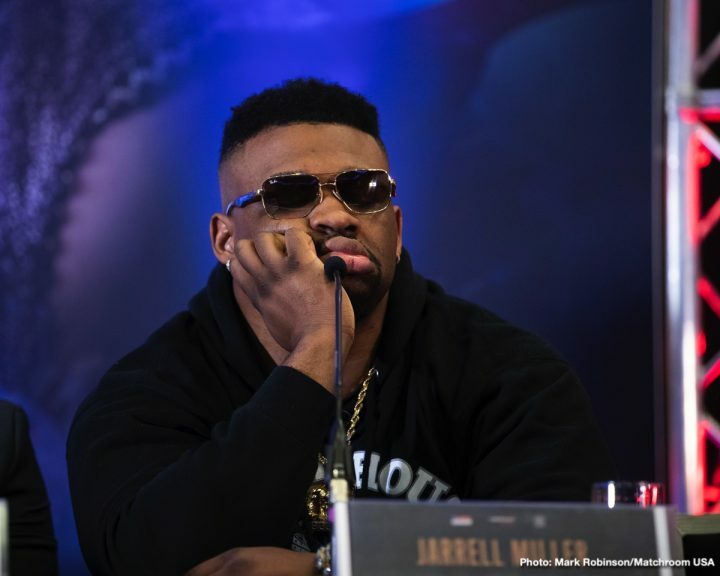 By Scott Gilfoid: It looks like the Anthony Joshua vs. Jarrell Miller June 1 fight could implode with the news of “Big Baby” testing positive for the banned substance GW1516, according to Dan Rafael of ESPN. IBF/WBA/WBO heavyweight champion Joshua (22-0, 21 KOs) is supposed to be defending his titles against Miller (23-0-1, 20 Ks) on June 1 on DAZN at Madison Square Garden in New York. The positive test for the 315 pound New Yorker Miller came from a March 20 random urine test by the Voluntary Anti-Doping Association [VADA]. The test came during the news tour that the two fighters made to announce their June 1 fight. Miller’s positive test for GW1516, whatever that is, puts the fight in jeopardy. What will Joshua’s promoter Eddie Hearn going to do now? He wanted Miller, and thought he was a keen choice, and look at what a mess it’s become. Joshua, 29, was supposed to be making his BIG debut in the United States, a fight that Hearn said would transform him into a big star in the U.S overnight. Well, it looks like Hearn’s vision thing could be thrown off if the fight gets canceled. It’s still early enough for Hearn to look to a replacement opponent to face Joshua instead of Miller. Luis “King Kong” Ortiz (31-1, 26 KOs) would be an ideal fighter to take the spot of Miller. Yeah, Ortiz wasn’t born in the U.S, but he lives in Florida, which is very close to New York. Ortiz is arguably a far better heavyweight than “Big Baby” Miller, and a lot more dangerous. As long as Hearn is on board with Joshua fighting a talented heavyweight that might beat him, it would be a great option to have the 40-year-old Ortiz take the fight. Ortiz gave WBC heavyweight champion Deontay Wilder all he could handle last year before getting stopped in the 10th round in March 2018. Since then, Ortiz has won his last three fights in beating Christian Hammer, Travis Kauffman and Razvan Cojanu. Unfortunately, Deontay Wilder is already scheduled to defend his World Boxing Council heavyweight title against his WBC mandatory challenger Dominic Breazeale on May 18, so he’s out. You can’t use Wilder. Hearn COULD have set the fight up between Joshua and Wilder if he were willing to give the Bronze Bomber the 50-50 purse split that he was asking for to take the fight. Hearn and Joshua didn’t want to give Wilder the split that he was asking for, so now they’re stuck with a potential open date with less than two months to go. Oh my, what do they do?